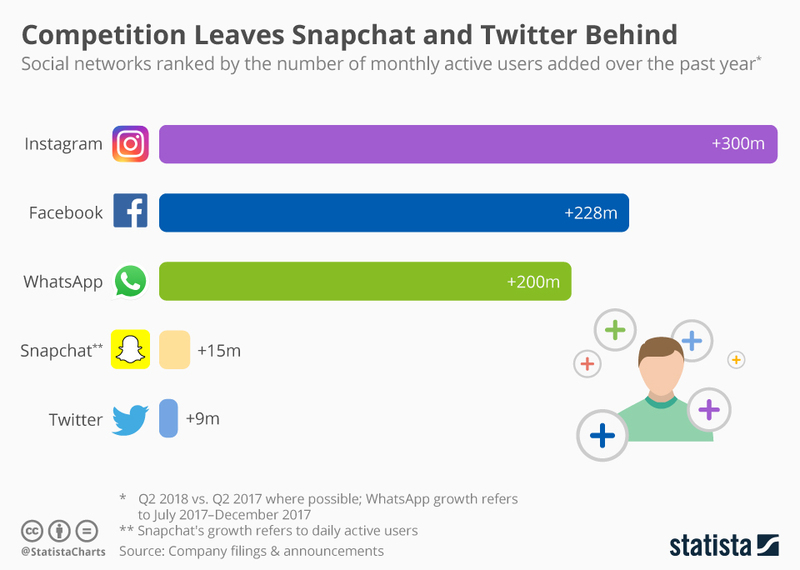 Facebook and the social media apps that come under it such as WhatsApp and Instagram have left Twitter and Snapchat way behind in terms of monthly active users. Both the apps can't even compete with the growth of Facebook and its owned allies observed in the last 12 months. Each of these apps got such a number of new visitors that exceeds the total of Snapchat’s users in all with a count of 188 million. Twitter does not tell a much different story either. Snapchat’s growth doesn’t seem to be significant enough in front of these social media giants. The chart from Statista depicts the user growth of Snapchat which shows to be not very noticeable in front of the growth of Instagram that topped the chart. The main reason for its small growth seems to be its demographic, which mainly comprises of teenagers and young adults. This limited approach and hence demand might be the reason why it's not flourishing as its predecessors. Twitter is also greatly lagging behind on its user growth as compared to its last boost in 2016 of 302 million users, which constitutes of only 33 million users since then. Let us see if we can see a better progress for these two sites in terms of growth in the coming years or if they will stay being behind these behemoths.